So, why are you here? Why am I here, for that matter? 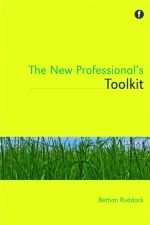 It all started back in October, when Sarah Busby from Facet emailed me to ask if I’d be interested in putting together a toolkit for new information professionals – something by new professionals, for new professionals. Once I’d got over the shock, I burbled ‘of course!’, and we started talking about how we might put it together. One of the things we decided we needed was a website to support the book – a place to drum up interest, share information, and bring together all the extra reading and online resources that will be mentioned in the book. As you may have noticed, it’s taken me a while to get round to doing this. I’d originally planned to do it almost immediately – get the website up, have a focal point for potential contributors to find out a bit about me and the book. A quick win, I thought. So why has it taken me so long? Because, readers, I couldn’t think of a darn thing to write about. Nope, not at all. I managed to get as far as ‘contributor bios!’, and stuck fast. What else could I possibly write without giving away so much of the content that no-one would want to buy the book? I asked Ned Potter for advice (as I’m prone to do when I get stuck on things – he always has ideas! ), and he suggested that I needed to make sure that the content wasn’t just promotion, but was something people would be interested in reading for its own sake. This got me thinking – what could I blog about that people would want to read? ‘Things of interest to new professionals’ was my first thought – but what a hideously unmanageable remit! How do I narrow it down? It can’t take too much work, because I’ve still got to do the actual book as well, and that’s hard enough. I mean, what do I know about editing a book? That’s when it hit me. I don’t know anything about editing a book – this is seat of the pants stuff all the way, baby. And so other new professionals probably don’t either. Why don’t I blog about that? What it’s actually like, as a new professional, to edit your first book? A true tale of the trials, triumphs, and tribulations. Surely that would be both interesting and useful? Sounds like an awesome book! A much needed resource, I think. I’m looking forward to reading about your experiences throughout the process. Thanks Alisa! I look forward to writing about it all – will help keep me focussed and sane!